We are so White around here. We have had tons of snow fall. I got a bit of brown sewn together and then worked at the the Black and White fabrics too. This is all I got done for the real RSC2013 projects. I have been sewing mostly on my older singer. What a great work horse. 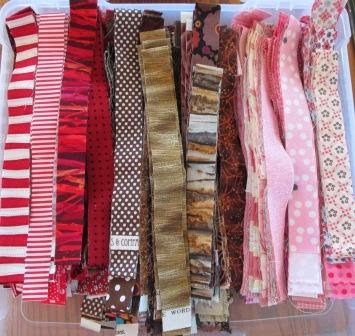 These scraps have been helping me with the next new project. I have been cutting brown strips. I have been a little distracted and not just using scraps. Log cabins. I just love them. It is keeping me out of trouble well I wait for the next Bonnie Hunter mystery to get started. Funny how just before the mystery starts I just want to sew so badly. I get tons done on some other project before hand. This is a great brown quilt I got quilted for a customer this week. So much brown this week. As this month the colour for the RSC2013 is Brown you get to see my Brown Dog Lex. 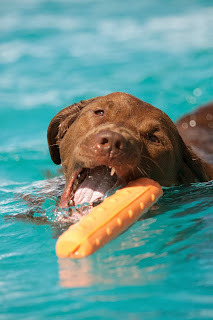 I just love this photo taken by Darcy Evens at the Dock Dogs event this past Aug. My T-Rex Dog. There is more scrappy Browns over at Socrappy. Love your log cabin blocks! How big are your strips? Love all your browns, and your red log cabins. Very nice. I am ready for spring, already. I've been using a lot of brown lately, too. 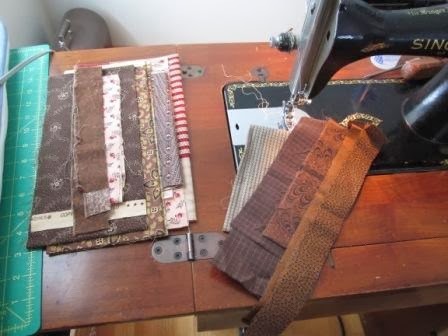 Pumping out football quilts and creating a lot of brown scraps. I need to sew them up, but I just keep throwing them in the scrap pile...ugh. 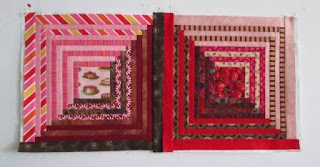 Love your red log cabin blocks! Will the quilt be all reds all the time? That would be gorgeous! Love your brown T-Rex, too. We have "Dog" on our list of things to shop for after we move. It's been 20 years since we had one, and its about time for another. Thanks for sharing yours. Those stripes in the log cabins are awesome! Live the picture if Lex. I am patiently waiting for the mystery to start too but will wait for Monday to start it. Your log cabins are amazing! 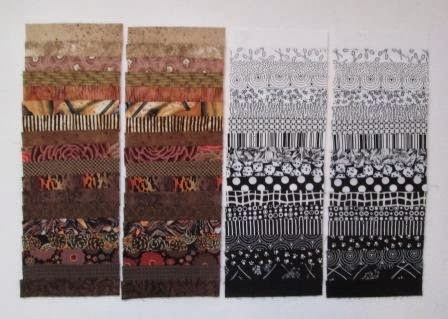 Tiny little strips--1/2"? I could definitely get distracted / lost in that project!! Looking forward to the mystery too! Your red/brown log cabins are just fabulous. Funny hearing you say you've had so much snow. We are heading into summer and the humid season has started :-( Just now I would love to trade! So many great browns. Your log cabin blocks are fabulous! Glad you are staying busy until the new mystery starts! So exciting. Your log cabin blocks are beautiful, the red and brown are so warm. The narrowness of the logs adds to the beauty. So much to comment on! 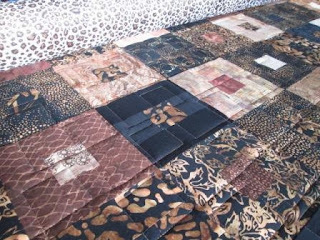 Great to see all the brown projects going on - your customer's quilt is lovely! I'm bowled over by the log cabin blocks - the narrow strips make them so striking! Glad to see another vintage sewing machine user. And give Lex some ear scratches from me! Oh my - I really like your log cabins. They look so yummy! Love the log cabins. What size are the strips and the blocks?